Cardio workouts have their place. 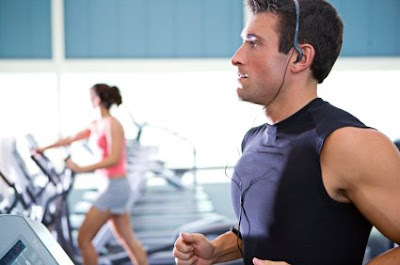 A lot of people look at their cardio workouts as a weight loss tool only. Sure, cardio can help your weight loss effort, but the real benefit is to develop your heart and lungs, improving your energy and making your daily activity more efficient. The body is a pretty amazing system. When you’re beginning your workout program, you might be able to only do 20 minutes at a moderately elevated heart rate. As health and function improves, you’ll be able to more work with the same effort. Many people hit a plateau with their cardio workout (and their resistance workout) where they’re comfortable and stay there though. I see people doing the same workout at the same pace and same intensity. At one time it might have taken their body 300 calories to perform that effort. Now that they’ve improved it might only require 250 calories. Looking to bust through that plateau and make a difference? Try changing your intensity with interval workouts. First, make sure you’ve built up a sufficient cardio base. After your warm up, bring your heart rate up to 65%-75% of your max for 5 minutes. Next, crank up the intensity to 85% of max for one minute. Repeat this cycle 3-5 times and then cool down. Try this once a week. If you have any heart or other medical conditions, make sure you’ve been cleared first. Need help developing a results-driven program to meet your goals? I can help. Ask me. 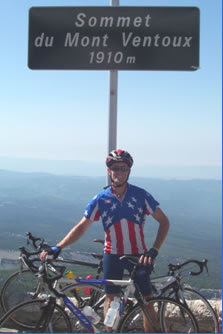 Two years ago, I had the opportunity to ride one of the most famous mountains in France, Mt. Ventoux. The Giant of Provence dominates the landscape in southeast France. It’s eerie top portion, referred to as the Moonscape, is nothing but white rocks. Nothing else. For riders in the Tour de France, it’s demoralizing because you can see the summit for the final 7km but you never seem to get there. For me, it was anything but demoralizing. I felt incredible as I rode the 22km climb with an average incline of 7.7%, sometimes kicking up to over 11%. I rode the entire climb with a giant, stupid grin on my face because I could hardly believe I pedaling my bike up one of the most iconic climbs in cycling. It took 2:15 to get to the top. I spent almost an hour on the summit before making the ripping fast descent in 20 minutes to the town of Bedoin in the valley below. I trained hard leading up to the trip and it paid off. The Ventoux will be used in this year’s Tour de France this Saturday, July 25. never before has a climb this large been featured this late, with the race’s final day coming on Sunday. With a massive climb like this on the penultimate day, there could be fireworks among the leaders. Learn more about the good and bad carbs, and many other topics, by downloading my free report, 13 Fitness Myths Busted! You can get your copy on the right side of this page. Those fad diets all want you to believe that all carbohydrates are bad and do nothing but add weight. Fact is that there are actually some brain functions that rely solely on carbohydrate. Also, fat can only be burned effectively in the presence of carbohydrate. Without carbs, your body turns to the muscle, breaking it down for energy instead. That’s bad and counterproductive to improving fitness and weight loss. Go ahead. Get it now! I’ve posted a bunch of videos to You Tube showing different, easy to implement, exercises that you can incorporate into your routine. Here’s a sample of a core stability exercise called a Floor Bridge. You can check out this video and many more on You Tube. While you’re there, I’m going to ask for your help and vote them up. Sleeping more can help you lose weight. Really. No lie. That doesn’t mean that you can just snooze your way to getting thin, you still have to do the work and burn the calories. But, getting enough sleep, typically 7 to 9 hours nightly, contributes to helping your body rebuild itself and get stronger. Research also shows links between altered levels of two hormones, Gherlin and Leptin. Gherlin creates feeling of hunger and Leptin tells you that you’re full. Lack of sleep elevates Gherlin, making you think you’re hungry, and depresses Leptin, making you think you’re not full. So, set an earlier bedtime and you’ll be one step closer to your goal.